Five hours catch of black bass at Spring Lake. The Jackson-Corbett prize fight at San Francisco, last night was undecided at half past three this morning. The giant heavyweight contest between Jim Corbett of San Francisco and Peter Jackson, the colored champion from Australia, which has been the main event in sporting circles for many weeks, came off at the California Athletic club in San Francisco Thursday night in the presence of an immense crowd. The fight was for a purse of $10,000, $1500 to the loser and it was regarded in sporting circles as having a great bearing on the world’s championship, it being generally understood the winner would have to meet all comers, Frank Slavin or any others. Betting was decidedly in favor of the colored man although Corbett’s money was plenty. The fight began at 9:30 with both men in fine form and it was a scientific mill in the start. Corbett greatly surprised his friends by his agility and the ease with which he stopped the Australian. His tactics were admirable and he outgeneraled Jackson at every turn. Honors were even for several rounds until Corbett began playing on the colored man’s stomach, receiving little punishment in return. The fight ran along with any serious injury to either, for sixty-five rounds, until 1:30 a.m., when both men were exhausted and unable to strike an effective blow, and the referee decided the contest a draw. The decision seemed to satisfy everybody, although the general feeling was that Corbett had made the best showing. First heat—D. Cutler’s Jr.’s Priscella, 1st; G. Savidges’s Victor, 2nd; Covey’s Rob Roy, 3d. Time 1:34. Unfinished race of Saturday, May 16th, 2:30 trotting, three half mile heats trotted today. Won by Rob Roy. Time, 1:29, 127½, 125¾. Exhibition running by Savidge’s California Bell, ¼ mile. Time, 28½ seconds, 2d heat; 29 seconds, 1st heat. One-half mile exhibition, Savidge’s Beulah. Time 1:26½. Crepe McNett exhibition ½ mile, no time taken. First heat, ½ mile—Robbins 1st; Sprick 2nd. Time 1:41½. Race, 1/8 mile—Dead heat between Shippey’s Sprig, Wyman’s Black. No time taken. Starting Judge, Thomas Savidge; Associate Judges, Jno. Forrest and N. Robbins, Jr., D. Cutler, Jr., Secretary. The lawn tennis ground, corner of Washington and 6th streets, have been greatly improved lately. Jacob Barr was in the city yesterday telling big stories of fishing at the mouth of the river. 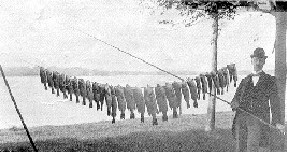 Judging from his statements, the black bass are eager for the fray with the summer tourists at Grand Haven.—Grand Rapids Morning Press. A party of 50 went out in row boats Saturday afternoon for a fishing contest. The contesting sides were led by Miss Lizzie McMillian and Miss Getie Kellar. About 300 fish were caught, and Miss McMillian’s side won by quite a majority. The party took supper at the Park and all enjoyed the affair hugely. Fishing is good and fishermen plenty. All trying to catch the big fellow and win the prize. The city takes pardonable pride in its natural resort advantages. The next best thing is to improve those advantages for all they are worth. Fishing continues good, and large hauls are daily credited to the good luck of some of our noted fishermen, and fisherman’s luck to others. An old experienced fisherman says there is more black bass in the Grand river this year than in any year for thirty years past. Another lawn tennis court is being built at 3rd street.